Looking for more information on your favorite hobby? 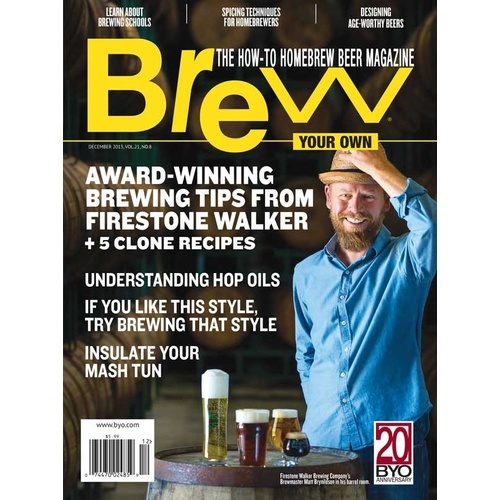 Brew Your Own magazine offers 8 issues a year of articles, recipes, brewing tips, and much more. A great way to keep yourself up to date with the most interesting gadgets and brews coming out! Note: Magazines will ship out in 1-2 months depending on where the mailing cycle is with the publisher. Please be patient. I have subscribed for 1 ur now. It gives good information on home brewers. I read it front to back. Hard to put down and refer back many times. At 50% off I canâ€™t resist to renew!!!!! Great value, and I love reading this magazine! Previous subscriber, lapsed subscription. 50% off offer! Best brewing magazine I've ever read! Already subscribed - great source of information. Love the magazine & love shopping with MoreBeer! Good mag at a great price, thanks. BYO has excellent, detailed brewing infomation and techniques. I already receive this. Extending subscription Great Mag. Have been a subscriber for over 18 yrs. How could resist 50% off. 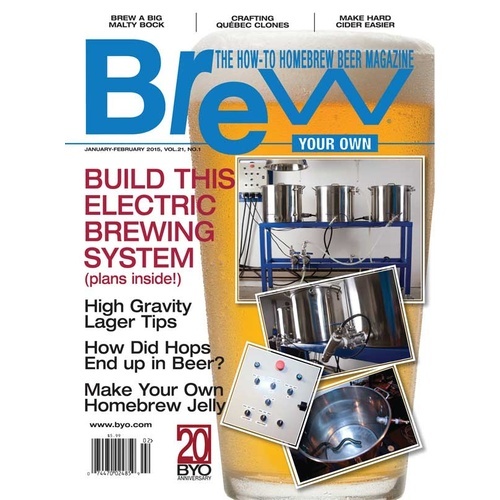 I love homebrewing and this mag. Because I love home brewing!!! How do I register my subscription at byo website? Is this offer good for renewals? BEST ANSWER: The renewal in this case would be a new subscription. No magazine. Only received emails. It's going on three months now since I've ordered. Customer service is looking to see if magazines were sent out, but I can assure them I haven't received one! I recommend ordering BYO some place other than More beer. The email articles are very informative as they address brewing on many levels from beginner to brew master. As far a a magazine is concerned,,, I haven't received either a link to online version or a hard copy through the mail.. Are the email articles the magazine?? I’m sure I would like it but have not received it. I have not received any issues to review. ?? Keep asking fo review...why not check subscription date first??? Love the information and advice! The best home brewing mag there is. I enjoy the magazine but, just wish they did would let me renew without jumping through hoops to get a better price. Thanks MoreBeer for setting this up so I can get a the better price. The magazine subscription arrived quickly, has very informative articles, fantastic recipies, and timely updates about what's going on in the brew world. Ordered subscription through Morebeer. I waited almost 3 months from first copy before I contacted Morebeer. Their response was quick but I was instructed my problem was with BYO not them. I contacted BYO subscription department and received a form return email that I would be contacted within 24hrs. 2 days later I tried again and finally received my response. They acknowledged their mistake but instead of beginning my subscription in February, they stated "your subscription will end December 2018" Will I receive my outdated magazines? 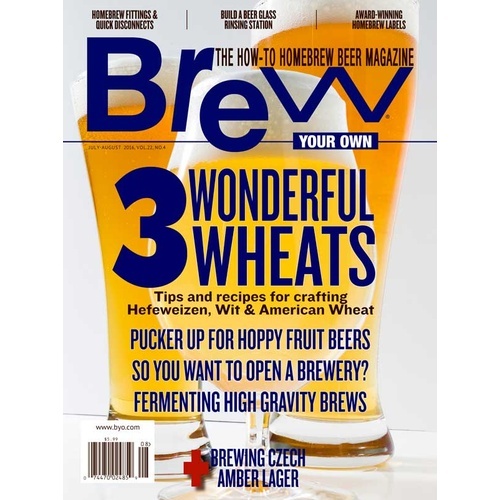 There are other very well done magazines for the Home Brewer, I recommend you look elsewhere. Love the hobby and the magazine adds to the fun. This mag is filled with crunchy technical details, recipes and equipment reviews. This is the only brewing mag I read cover to cover. My first Magazine arrived at the end of January; I ordered the first week of December. Seems like a long time but it's here and that's all that matters. Just received 1st issue, so much info! Only criticism many technical terms a newbie like me don't understand. I am sure in time this will not be a problem and it actually inspires me to learn more. Look forward to next issue. Information and ideas for home Brewing you can trust, better vetting and editing than many online sources. Great magazine. Definitely a great tool to improve home brewing skills. I HAVE BEEN GETTING THIS MAGAZINE FOR 3 YEARS. ALMOST FROM THE START OF MY HOMEBREWING HOBBY AND I STILL READ EVERY ISSUE COVER TO COVER. It takes awhile to get the first issue for some reason. Consistently received them afterwards though.